where am I: I should really close some windows. Real ones. aingeal8c tagged me for this one. I can never get the Print Scrn key method to work for me, but I found freeware that does ths same thing. I tag, hmm. This part's hard! aphephobia, naadi, bjohan57, scriggle, eltonroo. Also anyone else who wants to do it. More fun than you'd ever thought you'd have with your monitor! This is true. I mean, if you're breathing and all. Mmm, mature Paul. He is delicious. 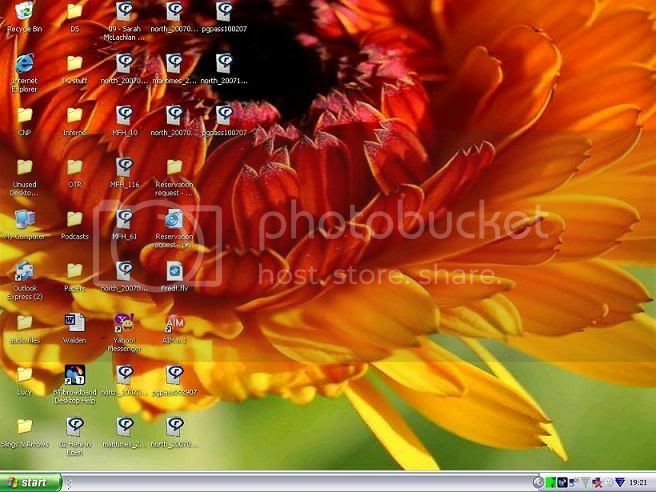 And WOW, your desktop is tidy. Mmm, mature Paul. He is delicious. Yes, yes he is. :) I've had this picture as my desktop since I discovered it. I probably should change it. Eventually. And WOW, your desktop is tidy. The neatness of my desktop is inversely proportional to that of my house. It's a sad, sad thing. The folders look a lot less organized inside them. I love that picture of Paul. I love that photo for the lines and creases and lived-in-ness. What was the freeware that you found, because the prnt scrn thing doesn't work for me either? *whimpers* Oh, yes. Paul is just a lovely, lovely man, no caveat needed. The freeware is MegaCap. It's ridiculously easy to use. How is it that he just keeps getting more beautiful? He is not human. He can't be. You know that slogan "You're not getting older, you're getting better"? It's actually true in his case. It's like a violation of some law of nature or something. Well yeah, but a really good violation. LOL. Background picture: I think I stole it from Andrea Scher's site. Or perhaps a site which I visited as a result of Andrea. I like it because it's so colourful and I like orange. I'm deep like that. I have many icons and folders - mostly fandom related on the desktop as otherwise I file things away and never find them again. 'Real life' is in folders, which is where I prefer to put things like that as I think of my home computer only as escapism. At the moment, I have the three passchen. clips, some The North This Week files which I put on my mp3 player as I commute, and a few episodes of My Favourite Husband. ...and see, I could never have a picture of Paul as my desktop - particularly those from the passchendaele set - as my husband can always tell when I've licked the screen. Ooh, pretty! I don't know Andrea, or even of her. Enlighten? otherwise I file things away and never find them again. That's my problem. My desktop is neat and tidy but my folders are like Fibber McGee's closet. I just hate clutter on my desktop. Which is strange because my house is in a constant state of OMG CLEAN IT NOW. I usually change my desktop picture like I change my mind (sometimes several times a day) but this one's been up for weeks because it's so pretty. Andrea is Andrea Scher - superhero, jewellery maker, photographer and artist extraordinaire, and one of the most inspiring people I have ever come across. (Ben is her little boy who came along after many years of trying). I have one of her neckalaces. I wear it every day and it always makes me feel better. I'm beginning to think my OTP is Centre Block/me. I've been known to sit and stare at these pictures. When I was actually in the building I'm surprised they didn't cart me off to the nearest Crazy Person's Home.